Today I am introducing you to the first 2 blocks of my newest Block of the Month - "The Friendship Quilt"
I have enjoyed stitching each block so much and can't wait to share the finished quilt with you. Each month contains a heartfelt friendship saying. Block 1 is - "A friend is one who believes in you when you have ceased to believe in yourself"
So very true. Each block is not limited to just making the quilt. The stitchery sized at 8 1/2" X 12 1/2" lends itself to being used in many different ways, A Bag, Wall Hanging, Cushion or many more uses. Collect all 9 and use them anyway you wish. 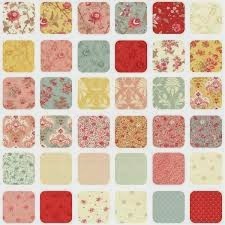 Each block is bordered by gorgeous 2 1/2" squares. The quilt uses an entire jelly roll which includes the binding. It also has a border fabric and 30" of background fabric. I am putting it together right now ready to be sent for quilting. The finished quilt measures 50 1/2" X 58 1/2". I am offering the BOM Programme in 2 ways. Paper Pattern Only for $12 per month or a Complete Fabric, Thread & Pattern Kit for $29.50 per month - Both run over 10 months and include full instructions to complete each block and finishing instructions for making the quilt in part 10. Over the next week or so I will reveal the rest of the blocks to you along with the finished quilt. Every block has little applique hearts which are cut from the jelly roll strips and easily blanket stitched down. Each block is bordered by beautiful chain stitched Cottage Garden Thread in Sweetwater which matches the fabric range "Printemps" and the DMC Threads I have used perfectly. Isn't it a gorgeous range? Sign Ups are now being taken for both options of the Block of the Month. Simply go to the Friendship Quilt Page at the top of the page or click the link for further info. I'll be back tomorrow to share another block with you.